How to Make Socca (Chickpea Flatbread) — Erin Parekh | Live Well, Simply. Before we get into the HOW for making socca — What is it? There are numerous ways to make it (and top it! ), which is why I love the recipe — it’s foolproof. And the ingredients are minimal, pantry staples. So if you have chickpea flour, water, salt, and olive oil, you’ve got the base for a satisfying meal. Traditionally, socca is served simply with olive oil and salt — perhaps a few fresh herbs if available. But I see it as a blank canvas for any and all toppings. Here, I added roasted fennel, shallots, kalamata olives, and fresh thyme before broiling. But it would be equally delicious used as a gluten-free, grain-free, vegan pizza crust or topped with a lemony arugula salad for a light lunch. Another thing I love about socca is that its base is chickpeas. The flour is minimally processed and naturally high in both protein + fiber. When searching the store, you can also find it labeled as garbanzo flour. Make sure to cook it well — you want it a little charred with crispy edges and completely cooked through. Not too thick, not too thin. It might take you a couple of tries to get the right thickness. The measurements here make 2-3 socca depending how you like it. SOCCA: The ultimate party snack, light lunch, or simple dinner. Whisk together chickpea flour, water, olive oil, and salt until well combined and no lumps remain. Add any herbs or spices, if using. Then, let sit for at least 30 minutes (or up to 2 hours) for the batter to hydrate. While batter rests, preheat the oven to broil. 5-minutes before you’re ready to cook the socca, set a 10-inch non-stick, oven-safe skillet on the top rack approximately six inches below the broiler. Heat for 5 minutes. Carefully remove the skillet from the oven using oven mitts and place on top of the stove..
Add 1-2 tsp. olive oil to the skillet and half the socca batter. Swirl it around the pan until evenly distributed. Top as desired (shallots, fennel, kalamata olives, and thyme shown here). Then, return the skillet to the oven and broil for 3-5 minutes until the top is brown and starting to blister. Make sure to watch carefully so as not to overcook or burn the top. Remove the socca from the oven and place on cutting board. Slice into wedges and top with more olive oil, sea salt, and any additional toppings. Serve warm. Repeat process with remaining batter. Serve immediately. 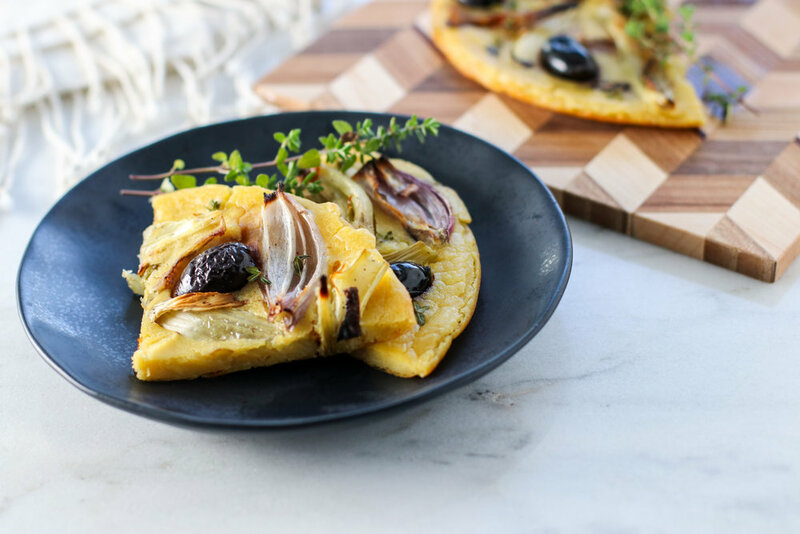 Socca is best eaten right away, but leftovers can be kept in the fridge for several days and reheated in a toaster oven. This recipe calls for a 10-inch skillet, but I’ve also made them into 4 individual servings using an 8-inch skillet and pouring a thinner layer of batter. Recipe and method adapted from The Kitchn.